SILICON SLOPES, Utah– September 10, 2015 – According to a new survey from Domo, sales leaders are growing increasingly frustrated with their business information, citing the growing disparity between what they want and what they are able to get. This lack of access to timely data is costing many sales leaders valuable time and causing them to lose confidence in their data. 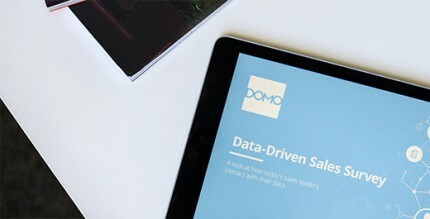 Today Domo released the findings of its first Data-Driven Sales Survey. This research queried more than 400 sales leaders (from managers to C-level executives) across a range of industries to understand their relationship with data. The majority of respondents —96 percent of them— said data is critical for day-to-day decision-making, but that the current status of their data isn’t cutting it; only two percent rated their relationship with data above an A-. While the survey clearly identified data accessibility to be a main challenge to the sales process, the speed and integrity of sales data were also key factors in the overall frustration sales leaders reported. Many expressed the sentiment that it was more of a question of if, rather than when, they would receive the information they needed. Ninety percent of respondents said having real-time access is important, yet less than 34 percent can access their data in real time. What’s more, 38 percent reported that they do not have any access to the data they need; 71 percent of respondents expressed frustration with how long it takes to analyze their data; and 65 percent said it takes too long to receive it. In fact, 31 percent said the time they waited was at least a few days or more. The report goes on to show that sales leaders are not only frustrated with data availability, integrity and speed, but where it is available to them. Some 92 percent of sales leaders want to be able to see data in a single dashboard, but nearly 70 percent of them don’t have such capabilities. In fact many —39 percent of them— are forced to spend at least a couple of hours each week creating their own reports, while 21 percent spend more than a day a week on reporting. Lastly, survey respondents communicated a willingness to leverage their data more if they had more help doing so. 73 percent said they would consume data more if they could see their data in one place; 66 percent if they could see their data in real time; 56 percent if they could see their data on any device; 51 percent if they had more time to analyze their data; and 29 percent if they had more time to collect data. For more information on the report or to download your own copy, visit: http://domo.ly/DDSalesSurvey.